Create a cozy setting with this lovely table and chair set to fulfill your patio or restaurant space. The black tempered glass adds so much presence to this set. Both table and chairs fold when cleaning the area or for storage. 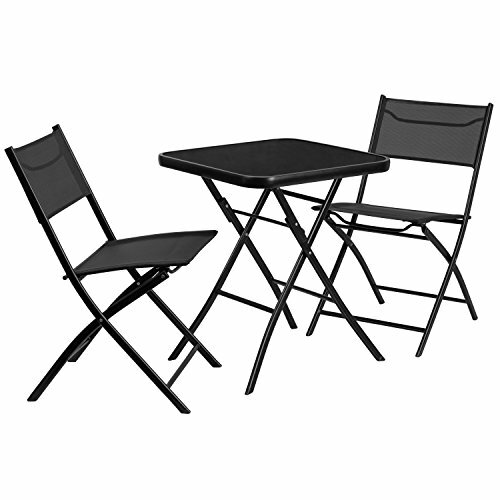 The lightweight folding chair features textured, textilene fabric and protective plastic floor caps. This 3 piece table set is designed for indoor and outdoor settings. For longevity, care should be taken to protect from long periods of wet weather. The possibilities are endless with the multitude of environments in which you can use this table, for both commercial and residential spaces. View More In Table & Chair Sets.